Oh boy. This is a big one, folks. We have been waiting a long time for this review… The Peak Design Travel Backpack is finally here. If you’ve been following us or you’re into backpacks, photography, or travel—you’ve probably heard of Peak Design. These guys have been absolutely killing it, making some of the most unique and innovative designs the backpack and photography world have ever seen. Their Everyday Backpack has been a huge hit amongst photographers and it has some of the coolest features we’ve ever seen on a backpack. The only problem is that it is very much built for photography—and although we like photography (and have a handful of professional photographers on our team), we’re always more interested in travel bags. 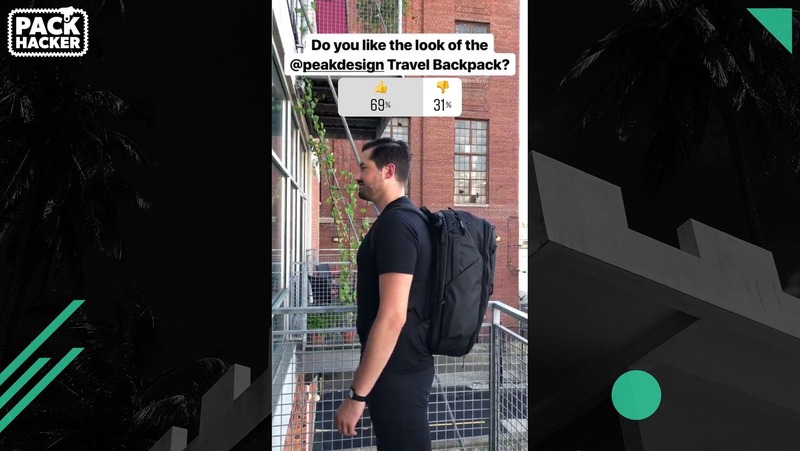 We’ve been hearing whispers about the Peak Design Travel Backpack for some time now, and needless to say, we were pretty excited to get our hands on one. We’ve been testing this thing out for three weeks and it’s seen use across multiple US states and a few flights. 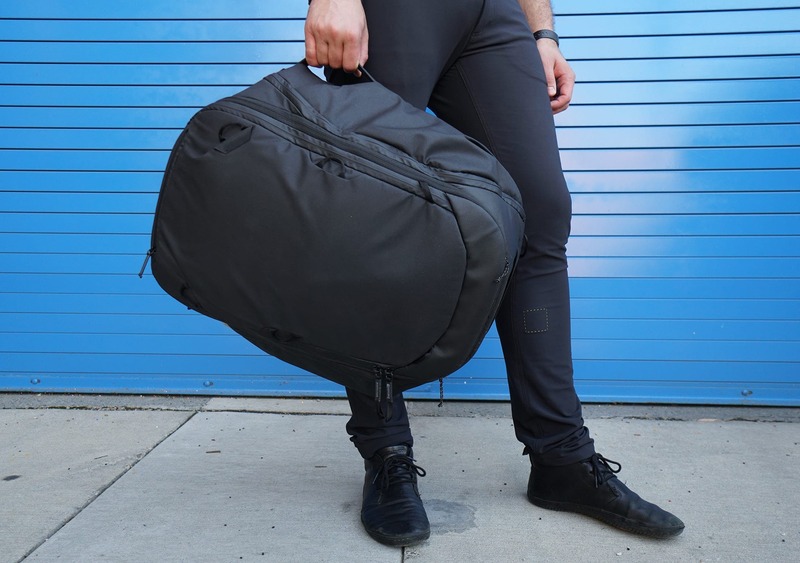 Much like their other gear, our first impression is that this bag has a lot of smart, innovative thinking, and it most definitely lives up to the hype. Is it without problems? Of course not. Check out the full review below for all the details. At the time of this review, the Peak Design Travel Backpack comes in two different colors—black on black, and sage—and we opted for the black on black (obviously). We should also mention that although pictures of the sage color look very similar to the ash color on the Everyday Backpack, it is slightly greener than you might think. That being said, Peak Design tends to release their bags in a lot of different colors, so we’re curious to see if they try anything later in 2018 or early 2019. Depending on when you’re reading this review, there might be a few new color options. Each color uses the same material, which is a 400D nylon canvas for the majority of the bag, and a 900D nylon canvas at the bottom to protect against additional abrasions. The stuff on the bottom definitely has a slightly rubbery feel to it. You might be curious as to why they’ve got canvas on this pack when most other, similar packs are rocking ballistic nylon… This was clearly an intentional choice made by Peak Design. It’s quite weather-resistant, and it feels nice to the touch. 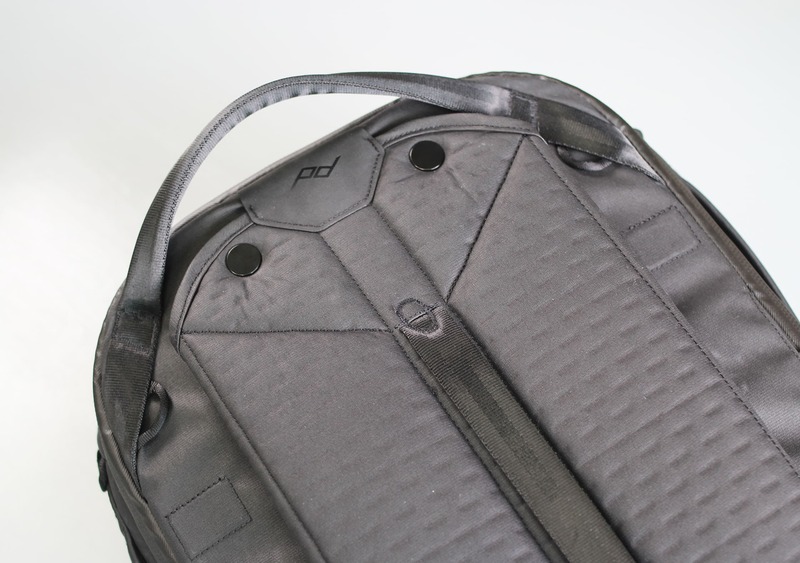 As far as the overall aesthetics of the bag, this thing is really sleek and minimal even though it has a ton of crazy features going on in it. We’ve also noticed that it does a great job of keeping its form even while empty, due to the high density foam padding around most of the pack. This may be a pro or con, depending on your use case and style taste. As we normally do, we polled our Instagram audience to determine how many of you folks like the look of this bag. Results were fairly conclusive, with 69% saying they liked the look of the pack and 31% saying they did not like the look. So, take from that what you will. Wrapping up the materials, there is a DWR coated polyurethane liner—which will add some more weatherproofing—aluminum hardware, and a bunch of YKK and Zoom zippers. To be honest, we’re bit confused with the choice of Zoom zippers, but we’ll cover that later in the review. 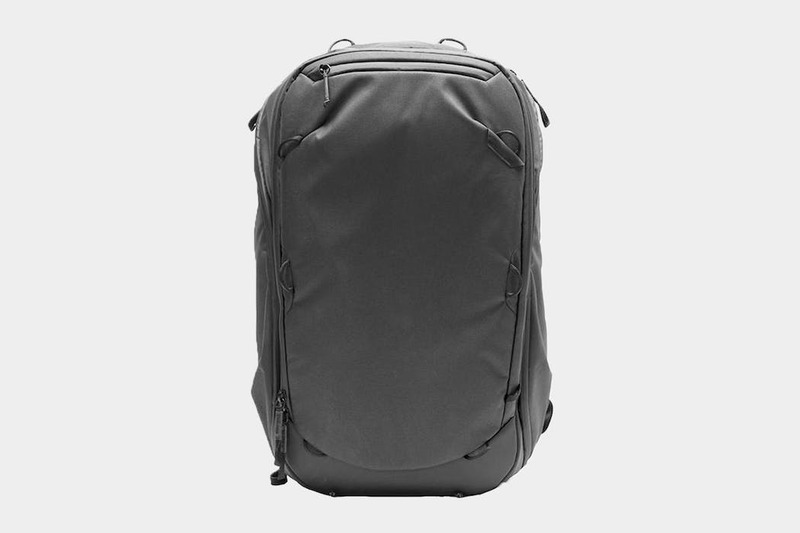 Even though it might not look like it, there are a ton of external features on this pack. We’ll start with the harness system, which is one of our favorite—and most innovative—pieces on this pack. The shoulder straps contain Peak Design’s signature rotating straps, which they’ve done with other packs, including their Everyday Backpack. These are really great for swinging the pack around your body and using it in “side access mode” while you’re wearing it. 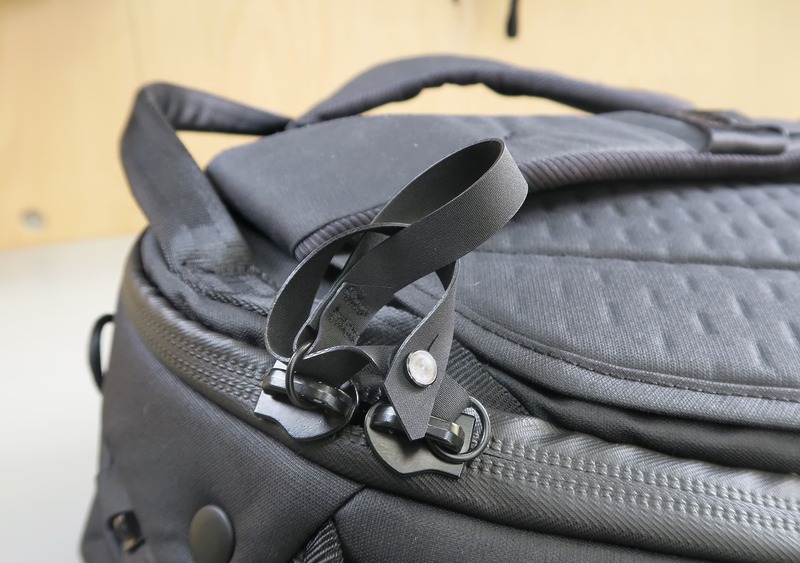 They’re basically just a normal pair of shoulder straps, but they’re connected by a single metal rivet at the top, which allows the top of the strap to move around to any angle you’d like. We should note that this plastic keeper can be a little bit hard to get back on if it falls off… You’ll probably have to take the bag off and fiddle with it a little bit. If you want see one of our favorite strap hiding systems, go check out the Evergoods MPL30. That thing offers really incredible ways to hide and manage excess straps. There is also a detachable sternum strap, which can be stored permanently in the vertical position along the strap, or temporarily as a little loop that hangs off. (This is all when you’re not using it, of course.) One minor detail is that it’s a little bit easier to detach than we’d like—one side grips a little bit harder than the other and it comes off pretty easily, which always makes us a little nervous. 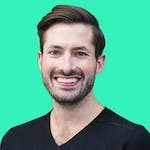 Peak Design does offer replacements on their site if you were to lose it, but we’d recommend just keeping an eye on it and making sure it doesn’t fall off. There is a hideable hip belt at the bottom, which has that signature rotating system we’ve come to thoroughly enjoy. 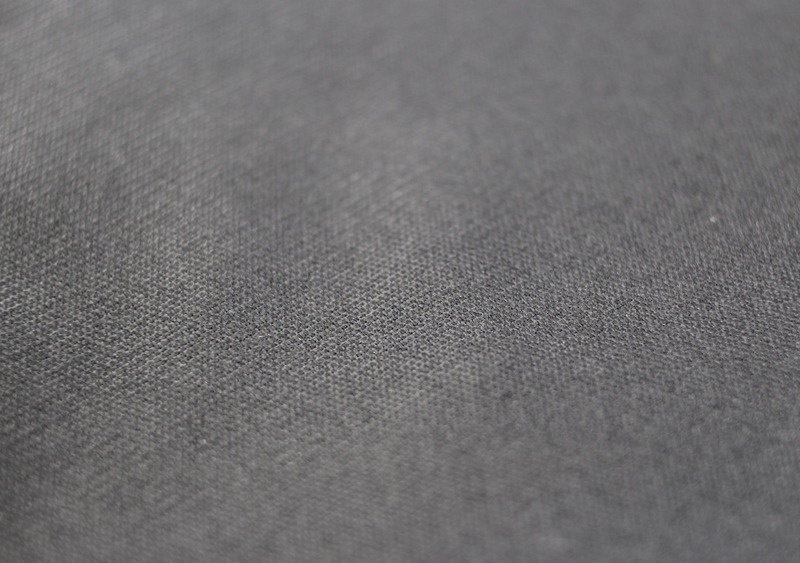 On the wearer’s left-hand side, there is a 3D, stretchy, mesh-like pocket that works well for flatter items. There’s a bit of give in this thing, so even stiffer items should work (which has traditionally been a problem we’ve seen on many of these pockets). 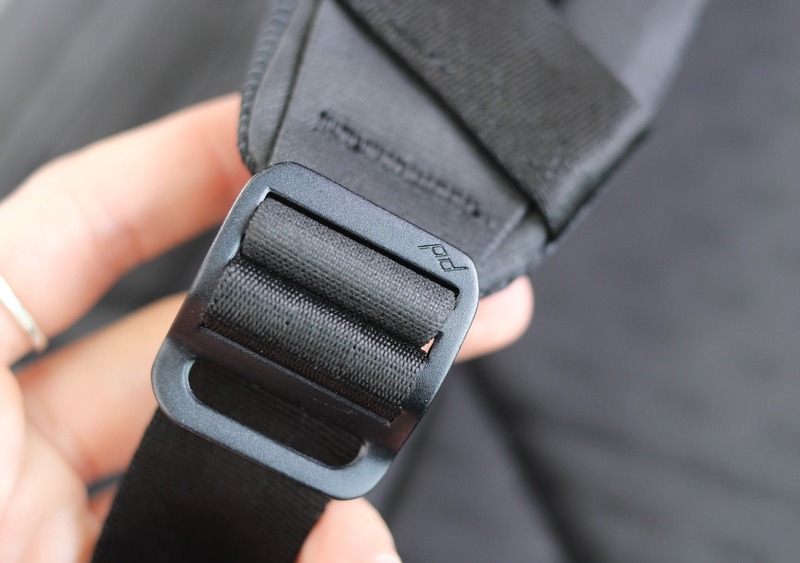 On the wearer’s right-hand side are some additional attachment points for things like the field pouch and other accessories that Peak Design sells. Okay, so we have to say… this hip belt is next to perfect. There’s the right amount of padding, it’s the right size, and it’s easily stowable when you don’t want to use it. Our one nitpick is the aluminum hardware, which takes a bit getting used to. It’s a bit different from the plastic buckles we all know and love, but once you do get used to it, it’s really a pleasure to use and helps to provide a nice carry. Plus, it’s never going to break—because, you know, metal and stuff. And now onto the main event. 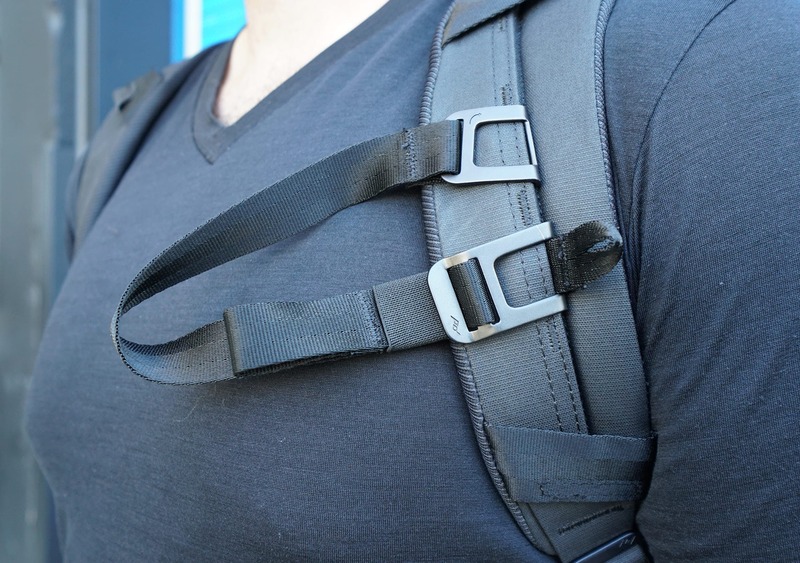 Everything on this harness system is hideable—fast. If there was a competition for “how fast can you hide your backpack straps,” you would want this bag. For sure. First, you rotate the hip belt upwards and slide it in. Then, you rotate the shoulder straps and hide them away just like you did with the hip belt. …And that’s it. No detaching straps, no zippers, no nonsense. 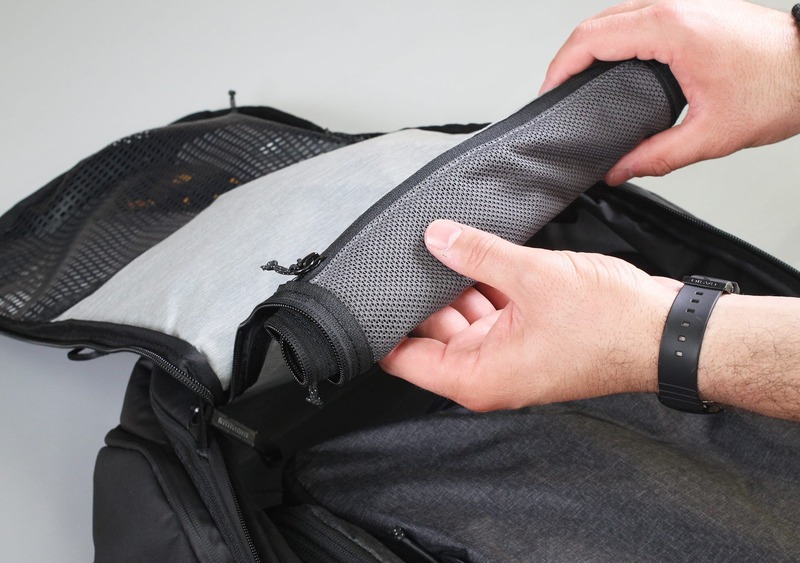 This is, without a doubt, the best strap hideaway system we have found to date. For real. Once you hide everything away, there’s a handle in the middle that can be used to carry the bag in duffel mode. It also works as a pass through system for roller luggage. 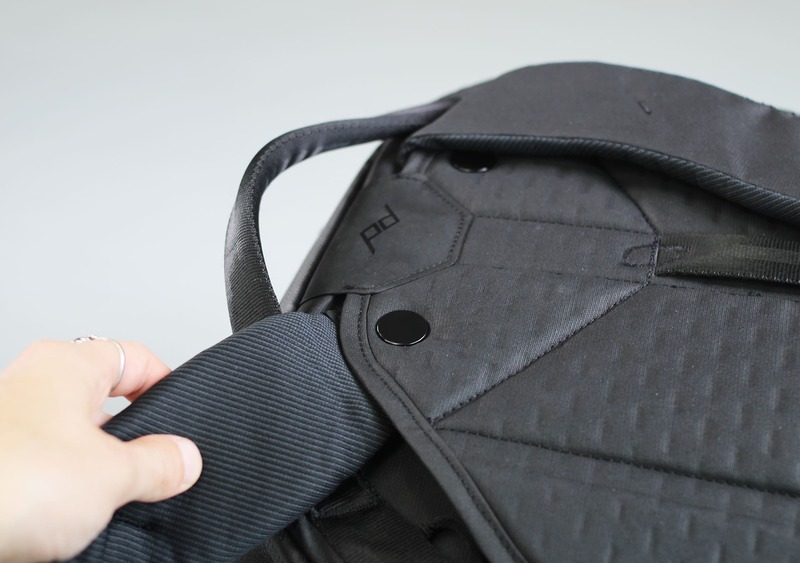 Also, while you’re using the shoulder straps you can fold in the material used to hide the straps, which gives the center of the back panel some extra padding and a little more airflow. Awesome, innovative thinking here—we love it. 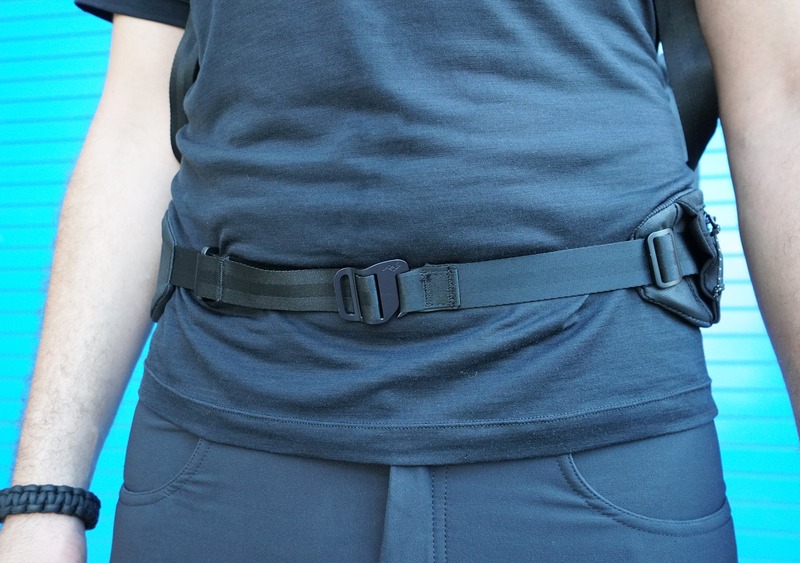 One small note here, when you’re putting the hip belt away you’ll want to make sure it’s as flat as possible, or else you’ll feel it in your back as you’re carrying the bag around. Clear windows usually work best here, because someone will actually notice it. As of right now, this thing is pretty hard to notice—we’d almost rather just have a tag hanging off the bag, as it really would take some looking to find a luggage tag in here. But hey, we get it. Clear windows are ugly, and this does help keep that minimalistic look that they have worked so hard to achieve. While our version is pretty loosey-goosey, the final production run will have velcro here. So no need to worry about your tag slipping out. Moving on to the side of the bag, there’s a water bottle pocket that is big enough to fit a huge Nalgene bottle as well as a slightly-less-huge S’well bottle. Outside of a gallon jug, we’re pretty confident this thing will handle any water bottle you might want to throw at it (or in it, heh). There is also a very stealthy zippered pocket within the water bottle sleeve, which is great for hiding items of any type. You might assume this pocket is unusable while you’ve got a water bottle in the main sleeve, but there’s a good amount of gussetting that provides quite a bit of expandability. You can easily fit some larger items (like a plus-sized iPhone) in here, or some quick-grab items—although we’d recommend avoiding large stuff if you’ve also a water bottle in the sleeve. This pocket is really secure, seeing as the zipper is virtually hidden, plus we’ve really never seen a pocket like this—which means that any potential thief probably hasn’t either. 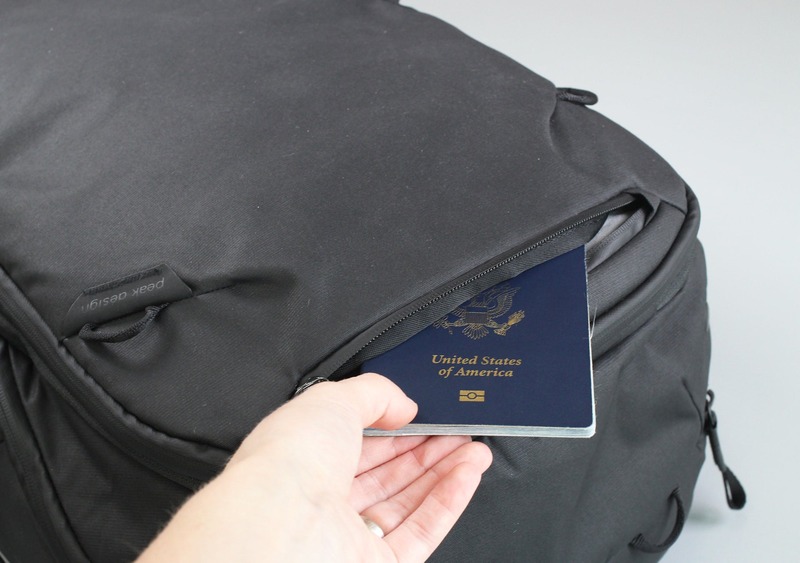 This is just one of those areas where you can tell that Peak Design has put a lot of thought and effort into making every square inch of this bag useful, which is incredibly important for one bag travel. Kudos! There are a total of four grab handles on this pack, which we love. The top handle is nicely padded and allows you to hang the bag flush against a wall, which is always nice. The two on the side are good for quick grabs, although because they’re not centered, using these for any length of time can be a bit funky. They are, however, perfect for grabbing the bag out of overhead bins. And lastly, there’s one on the bottom that really makes the bag grabbable from all sides—which we love. On the front side there’s a sneaky, hidden pocket that closes magnetically at the bottom and has the ability to hold some lash straps. The magnetic pocket is great for holding a rain fly—if you get caught in a torrential downpour, it’s nice to have that as an option for some additional weatherproofing. It could also handle some flatter items. The lash straps use a very similar system to what we’ve seen on the Everyday Backpack, and much like that bag, there are a ton of different configurations you could dream up—there are attachment points all over the outside of this bag, even on the interior of the water bottle pocket! We expect they’ll work pretty well. Lastly, there are two compression features on this pack. 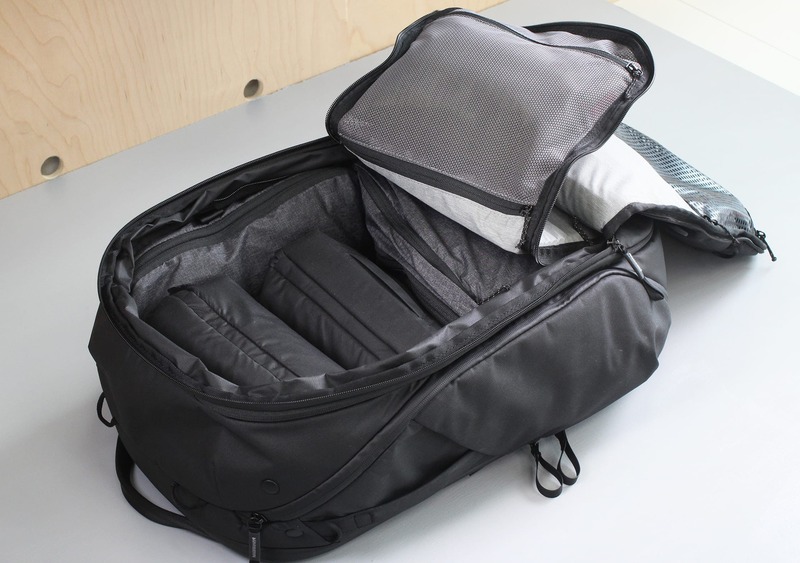 There are two compression zippers on the exterior that add a few more liters of space to the bag. And there’s also a very handy button system that allows you to compress the bag towards the top. This is a pretty nifty system that we haven’t seen anywhere else, but we should note that the placement of these buttons is not final—Peak Design is still working on it, and they’ve said that the placement on launch might be a bit different. Moving on the inside of the pack, there is a quick-grab pocket at the top of the bag with some stretchy mesh on the inside. This is a nice pocket for all of your airport essentials, and they’ve done a nice job making this pocket really blend into the rest of the bag. Very slick. Moving onto the interior of the front panel, there’s some really smart organization going on here. The top area has an interesting, rubbery-feeling mesh, which gets the job done and allows you to see whatever items you have in there. We like that the zipper on this pocket is a bit curved, so it allows you to have good access. Opening it up, there are a couple small sleeves for pens or pencils, and a few larger ones that we’ve been using for chargers and outlet converters. If you don’t want to use these pockets, that’s fine—they lay flat, so it won’t make a difference in the overall space of the bag. We should note that the pen pockets are a little loose—your pen might go rogue if you’re really throwing this bag around. Towards the bottom, there’s a similar pocket with no organization that is great for flatter items here. On the other side of this compartment there’s a pretty similar scenario. You’ve got a half-mesh pocket up top, and a liner pocket at the bottom. 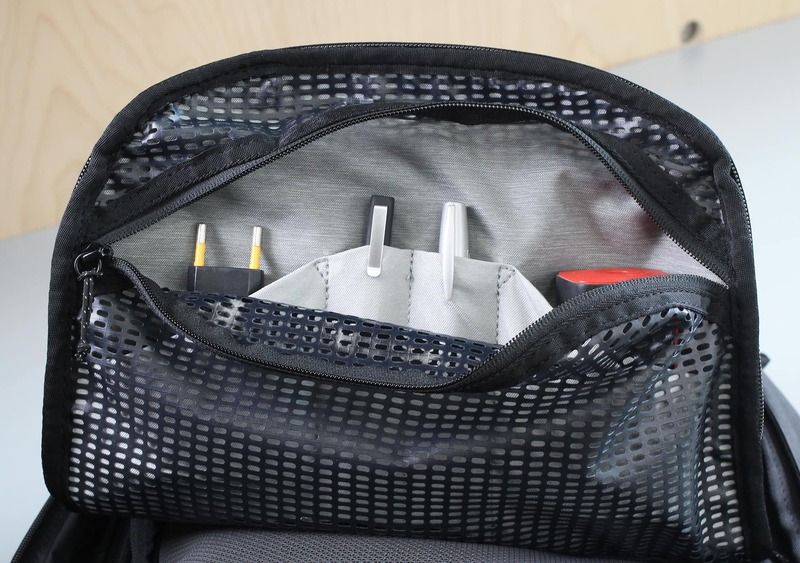 But what we really love about this compartment is that the pockets are accessible from each side of the bag. You have access from the main liter compartment and from the front side as well. 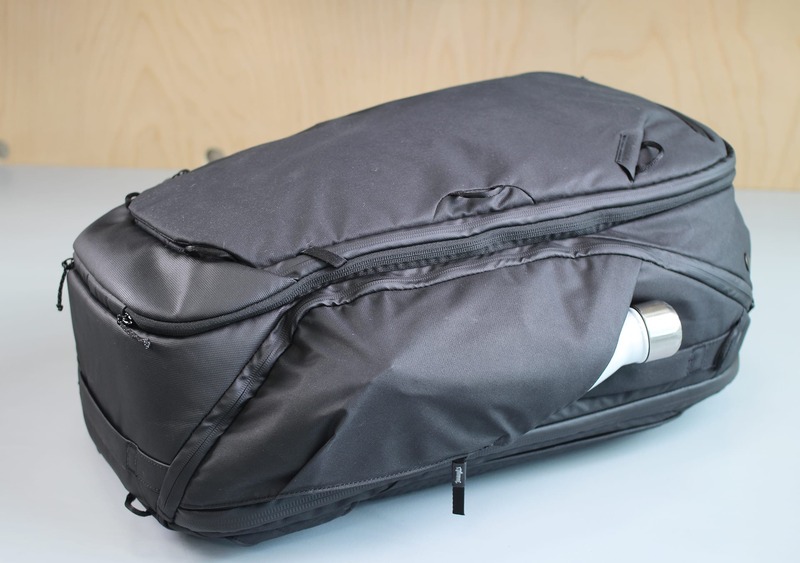 Plus, the separator unzips and you can stuff it into itself in the bottom of the main compartment—which allows you to essentially “remove” the separator and use the bag as a giant duffel. Brilliant. This is one of the innovations that make this bag really unique. 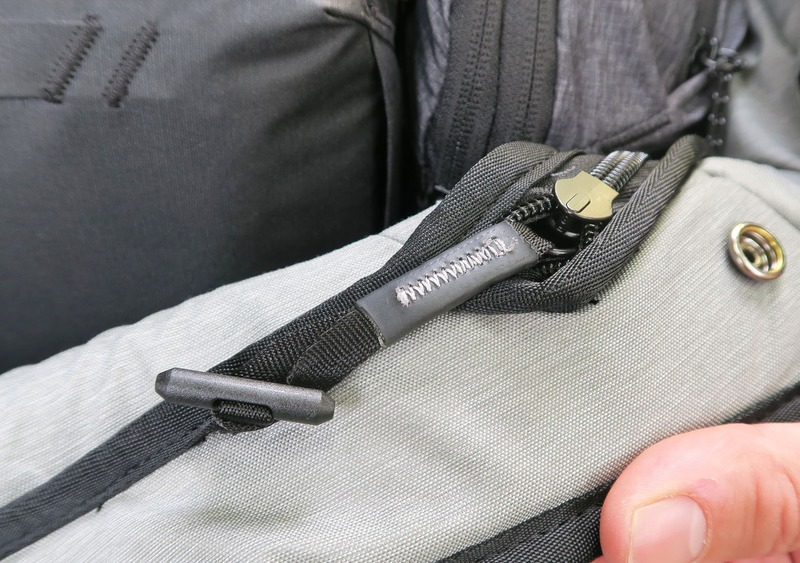 We actually utilize Zoom Zippers for all of our bags and packs! We’re really curious as to why Peak Design didn’t include YKK zippers across the entirety of this pack. There are some on the internal pockets, however, most of the zippers on the main compartment are Zoom. YKK zippers are on just about every heavy-hitting travel pack that’s in the premium category, so it’s pretty odd that they’ve decided to venture away from them. Everyone uses YKK, and we’ve never had a problem with them. We have, unfortunately, had some problems with Zoom zippers though. 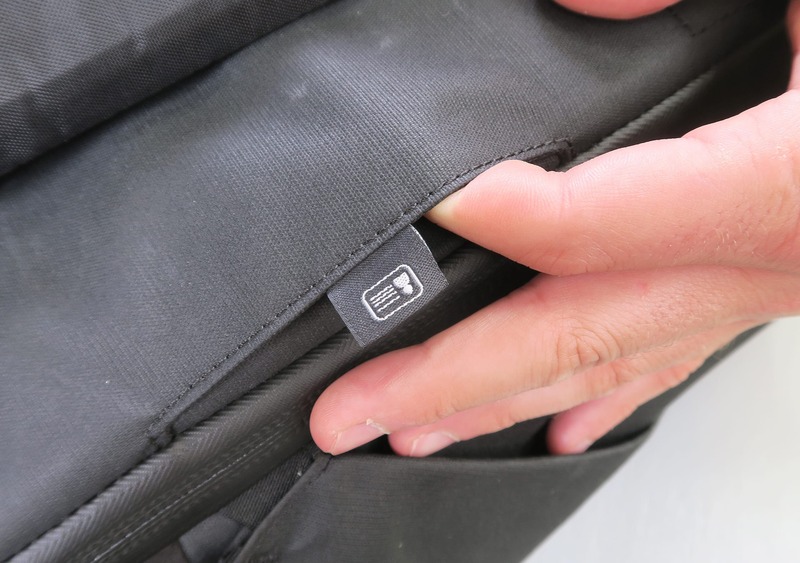 One of our contacts has been using the Peak Design Everyday Messenger and they’ve gone through two bags because the main zipper has broken on each of them. Another contact had the zipper break on her Everyday Backpack. In all three of these cases, Peak Design has handled the return and exchange of the broken zippers gracefully. They’ve replaced it with little to no questions asked and provided great customer service. However, that customer service and warranty isn’t going to do you much good if your zipper breaks in a remote village in Thailand. 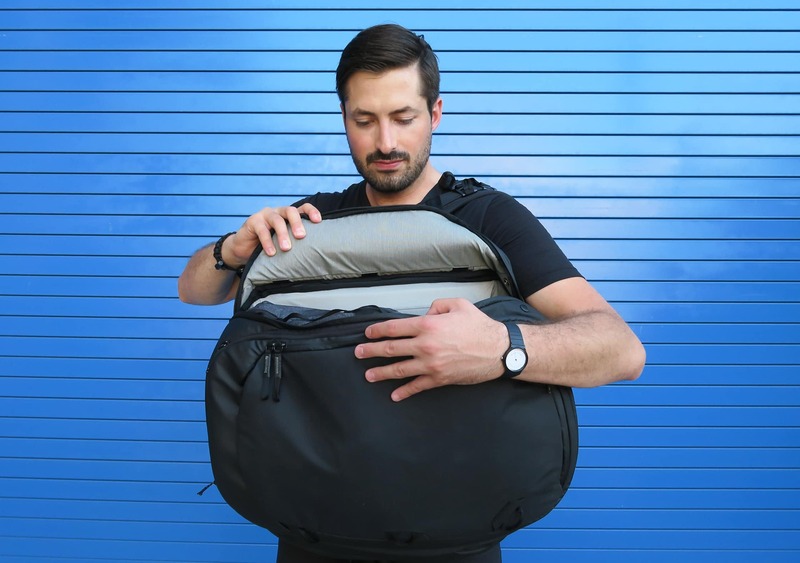 We’d rather have the zippers just not break in the first place—and we really hope the zipper doesn’t break on the main compartment of the Travel Backpack, as it would render the bag pretty much useless. It is a beefy #10 zipper, but it’s not YKK—and that gives us some cause for concern. Mostly all of the heavy hitting travel backpack brands opt for YKK. Okay, that was a ton on zippers. We got carried away. Let’s get back to that main compartment. Basically, this main compartment is a giant bucket that works well with Peak Design’s dedicated travel accessories and packing cubes. You don’t need to use their system, but it does help as they size them specifically for this pack. On the sides there are some elastic loops that are actually used to fully integrate their camera cube system. That offers a little bit more padding and locks all of your lenses and camera gear right in place—if that’s your thing. The laptop compartment is in the traditional “laptop compartment area,” and you can access it by unzipping the main compartment by just a few inches. 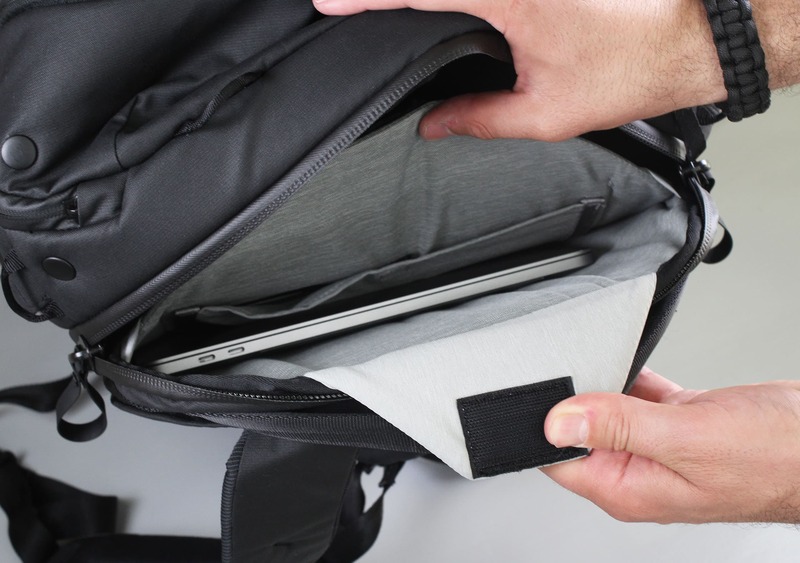 There’s ample space for pretty much any laptop you could have, and it all closes up nicely with some Velcro. There is also a separate tablet partition on the inside, which we’ve been using for our Kindle. One small issue with the tablet partition is that the Velcro target is a little bit small, so it’s kind of hard to accurately velcro it down unless you’re looking at it. In contrast, the laptop partition has some more Velcro and is super easy to close without even looking at it. That main compartment is also accessible from the zippers on the side—so if you have things strategically positioned in here, you can swing the bag around your body, unzip it from the side, and grab what you need. This is especially handy for the camera cube insert, allowing you to quickly swap out a lens or do other #photographythings. The zippers on the front side are securable via a loop at the bottom. The side zips attach to a toggle inside of the pack. 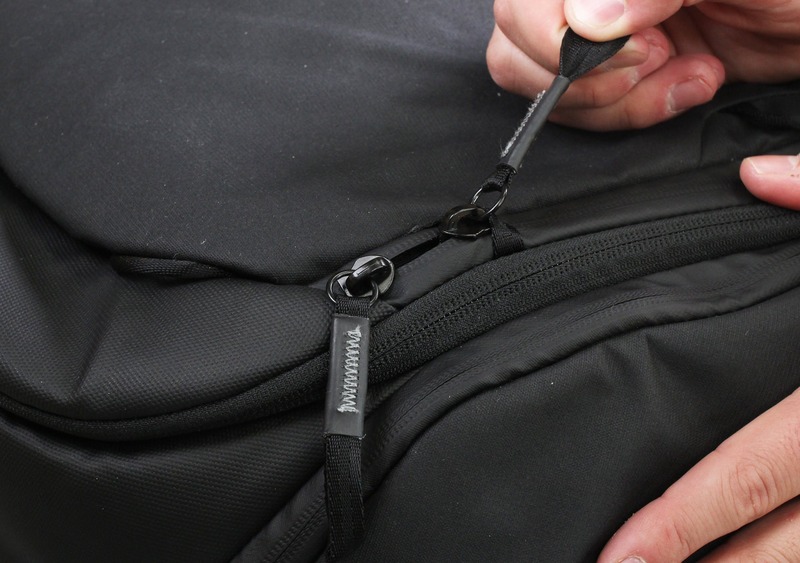 The big, main compartment zippers secure to each other via a loop-and-button system. None of these are completely foolproof, but they’re a deterrent. 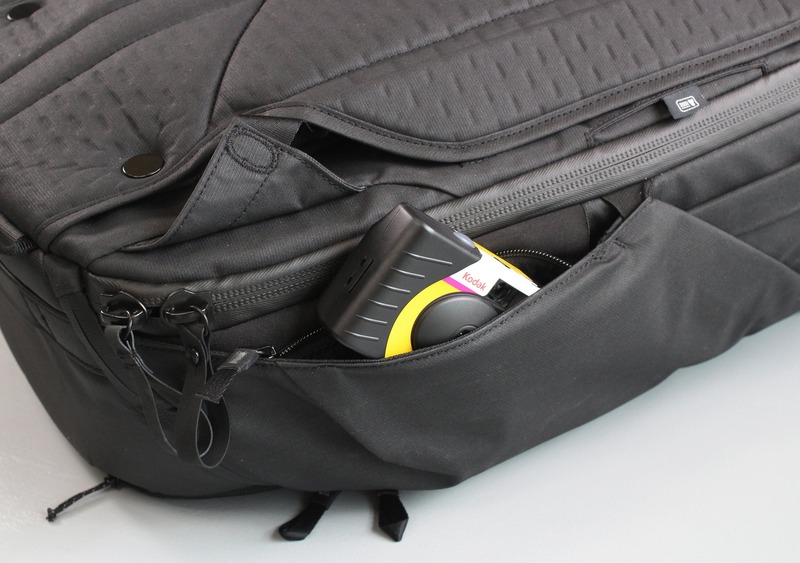 If a thief is quickly rifling through everything, they’ll likely just pass by your bag if they’re unable to access it quickly. 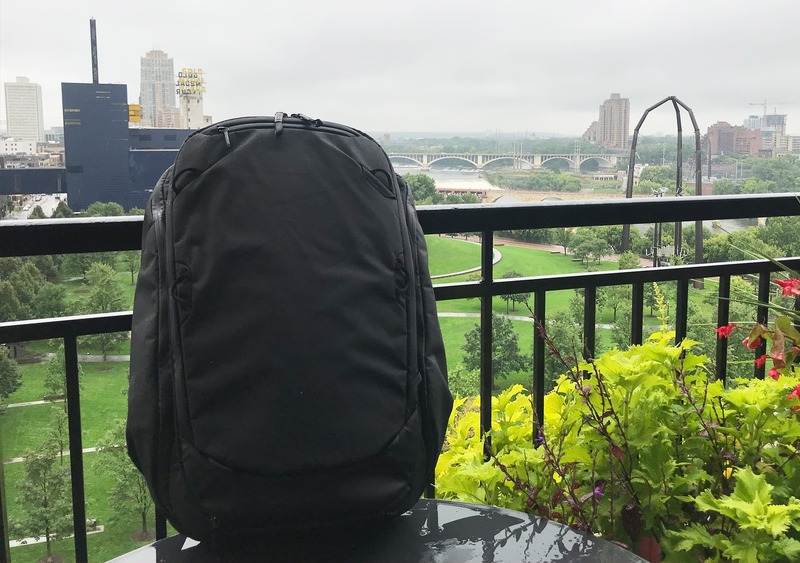 At the time of this review, we have been testing this bag for three weeks in Detroit, Minneapolis and Northern Minnesota, as well as two flights. Overall, it has been a joy to use—and after inspection, not much has gone wrong with the pack besides a slight scratch in the black aluminum hardware on the sternum strap. No visible marks on the exterior after three weeks and no problems with the zippers yet. And… that’s about it! We really don’t have much in the way of gripes about this bag—outside of those Zoom zippers—and we’re loving all the thought and effort Peak Design has put into this thing. Great! Really digging all these cool features, still getting used to some things like the hip belt clip. Still going strong—using this thing is a pleasure, and no durability complaints outside of a few scratches on the aluminum hardware. Feature-fit for almost any carry. Sternum strap comes off a little easily for our liking. Side handles provide a funky, imbalanced carry. 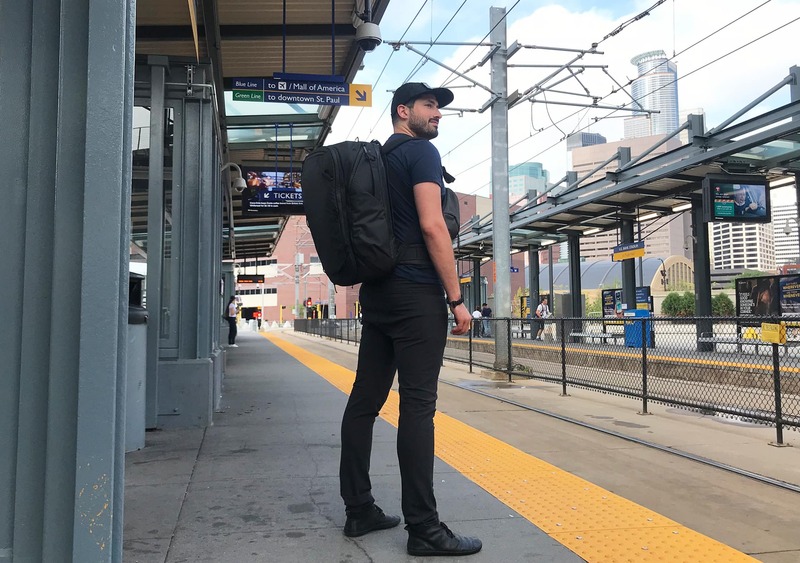 The Peak Design Travel Backpack is a well-executed travel bag from a company with an excellent track-record of bringing innovative and unique designs to the backpack world. This is a bag that can easily handle one bag travel, photography, or digital nomading with ease—and it will be a joy to use for any of those activities. 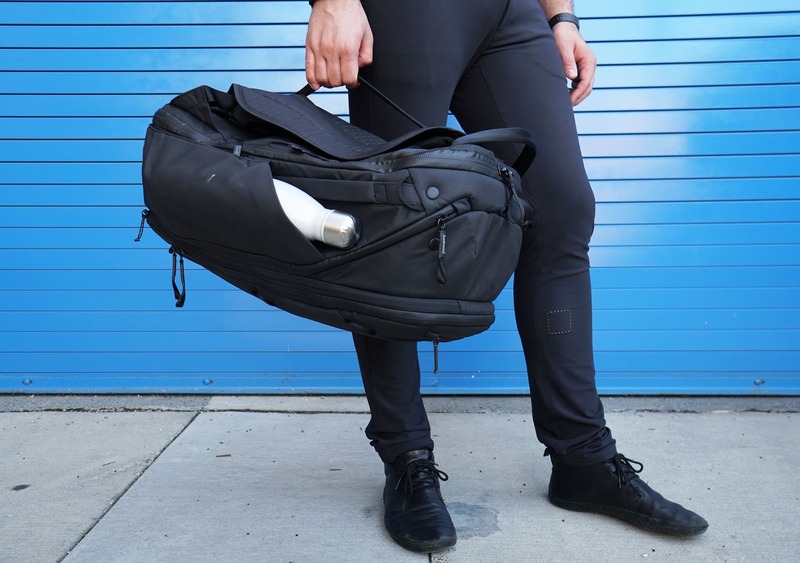 We have a couple small gripes—mainly the zipper choice, sternum strap, and side handles—but all of the amazing, innovative thinking that has gone into this bag vastly outweigh the few minor downsides. A winner, for sure.